Il Catanese Sicilian pastry shop in Rome: the land of the Cassata siciliana, cannoli, almond torrone, granita with brioche, marzipan sweets, almond milk… to name but a few. It is your go-to place for all the decadent Sicilian sweets you’ll crave. Right by the elegant Piazza Cavour in the Prati district of Rome, getting there is easy: you can either walk from the city center or take the subway to Lepanto station. At Il Catanese pastry shop in Rome, “tradition” is the word of order. Even its decor screams tradition with the many decorative pieces from Sicily. 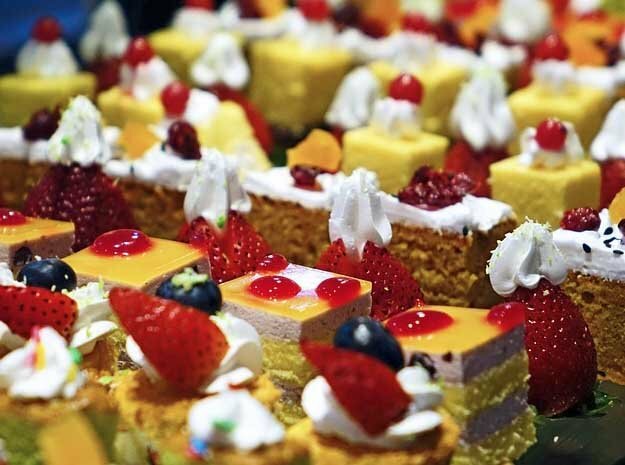 Here, you’ll find a selection of such an abundance of sweets and desserts that you’ll struggle to make a decision unless your ideas are clear. And as if there weren’t enough options, there is even a counter dedicated to homemade gelato and granita (the sophisticated cousin of the slushie). Just to make it even more challenging for you! Skip the cone or the cup, and have your gelato in a puffy brioche. Gelato will take a whole new meaning for you from this point on. But sweets are not the only reason to head to Il Catanese pastry shop in Rome; indeed the reasons are plenty! They serve up some delicious salty foods as well. One of the things that is absolutely worth a try is the “arancini“: a fried ball of rice that melts in your mouth, a Sicilian classic. They come in different flavors, but the spinach and cheese version is especially addictive. Should you pass by during aperitif time, you’ll be glad to find a very generous buffet to accompany your drink. So whether you are in the area during breakfast, lunch, snack or aperitivo time, this pastry shop in Rome has just what you need to satisfy whatever type of hunger you may have. See where to sleep near Il Catanese Sicilian pastry shop in Rome here!